Signals and Markers was a temporary river side installation for the Rosebank Art Walk. 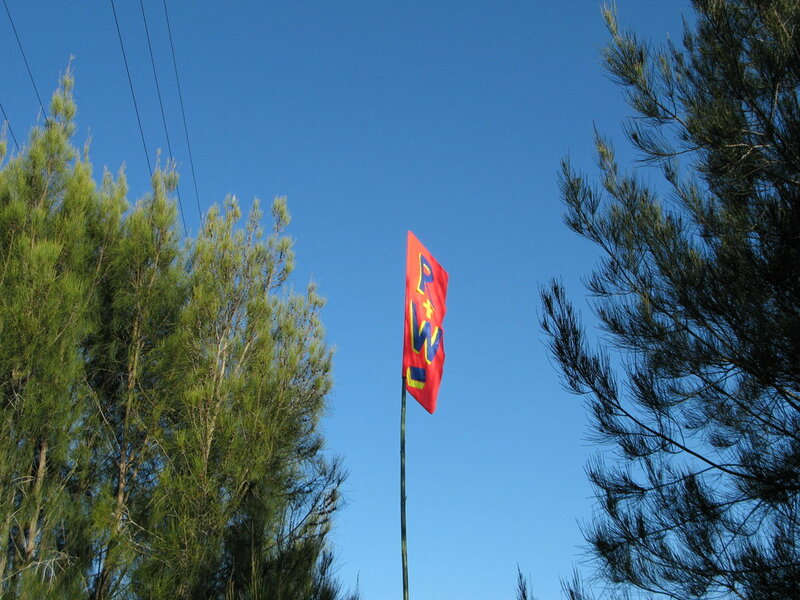 Recalling the land and river-scape formerly present along Te Whau River, HOOP-LA installed a series of tall flags along the riverbanks at key sites. The vertical poles and flags invoked the now destroyed kiln chimneys that previously inhabited a bustling river-side brick making industry. These signals, mapping the unmarked sites of the vanished brickworks, offered multiple viewpoints to enable a physical and logical understanding of how the river and its edges were in the past a central pathway, a place of much movement and trade. Echoing the important and essential work of the local amateur historian J.T. Diamond in recording both the physical presence and dismantling of the brickwork industry from the 1950’s, these flags were temporarily installed for the duration of the Rosebank Art Walk weekend in 2013 and recorded through photos from both the land and the river.